Aiseesoft iPad Transfer Platinum is a dedicated tool for management of all your iPad files. With it, you can export all iPad files to computers without iTunes, and import local files to iPad without any loss. Also it can help you rip any DVD disc and convert popular video/audio files to iPad compatible formats, then transfer them to iPad directly. What\\'s more, it works well with iOS 6, iPhone 5, iPad mini, iPad 4 and iPod nano 7. 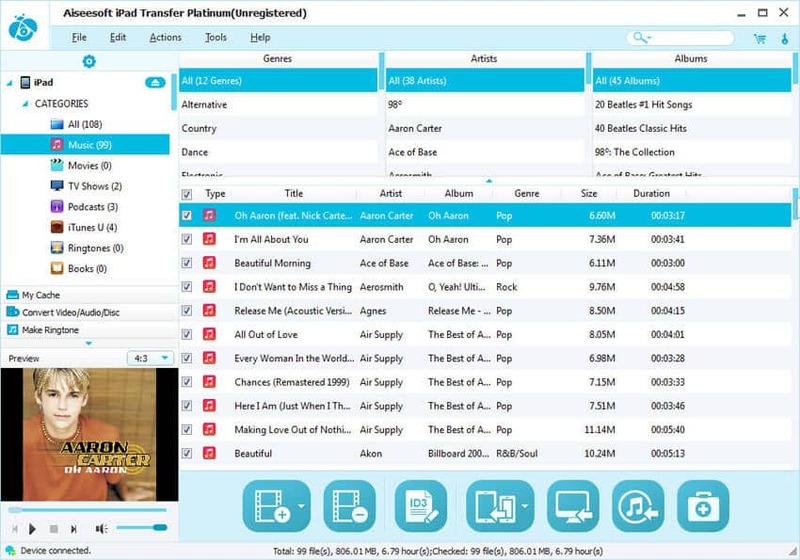 This iPad transfer software can be used to transfer iPad files including music, movies, pictures, TV shows, Podcast, iTunes U, eBooks, camera roll, voice memos, and camera shots to your PC and import local music, videos, ePub, PDF, and images to iPad with high quality and at fast speed. You can also transfer files to the formats supported by iPhone and iPod. More surprisingly, it supports the newest Apple devices. You can not only convert DVD, videos and audio files iPad compatible formats but also editing the output video effect during your transfer. This iPad Transfer can help users get your own iPhone ringtones from any DVD and video files. And you can also back up iPhone SMS (MMS) and Contacts to computer. This iPad transfer can fix your iPad database if the iTunes Database has been damaged. 4Easysoft RM to AMV Converter for Mac,as a professional Mac RM AMV converter,supports to convert RM to AMV for Mac and can also convert RM to MTV video. It is the best RM to AMV converter for Mac users to convert RM to S1 MP3 players. Mercalli is a program that lets you stabilise shaky footage during post processing. Mercalli detects and distinguishes between intended movements, such as panning or zoom shots, and unintended shocks and shakes.